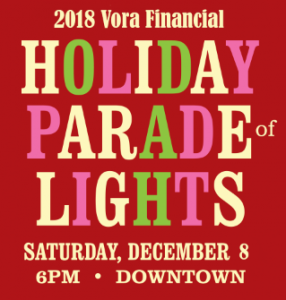 The Flagstaff Chamber of Commerce presents the Vora Financial Holiday Parade of Lights with support from APS at 6 p.m., Saturday, December 8th in historic downtown Flagstaff. This spectacular “electric” parade has become a favorite holiday tradition. Join the excitement and watch the streets of downtown Flagstaff light up the winter night as more than 60 floats, lavishly decorated with thousands of twinkling lights, parade through historic downtown Flagstaff. Get started on your Christmas shopping in historic downtown Flagstaff, visiting many of Flagstaff’s unique shops. Bundle up in your mittens and hats and plan on sharing the sparkle of the Holiday Parade of Lights with family and friends. The parade begins at the corner of Beaver and Elm Streets, continues down Beaver to Aspen Street, turns left on Aspen to San Francisco Street and concludes at the corner of San Francisco and Elm Streets.